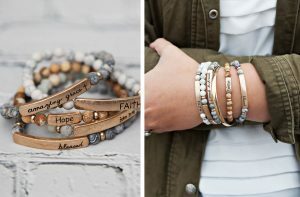 Inspirational Bar Natural Stone Bracelet for just $5.99 !!! reg price $17 !!! Love these !!! Inspirational Bar Natural Stone Bracelet for just $5.99 !!! reg price $17 !!! These bracelets are a perfect reminder to wear on your wrist everyday of happy thoughts! They are stretchy so one size fits most! These also make perfect gifts!